Stacy Horn » Blog Archive » Wait, they’re serious? Like I didn’t know it already, but we (humans) are insane. A lot of people are taking this whole judgement day thing very seriously, apparently. For instance, I’m hearing stories of people who took the week off, to what? Prepare? To pack for Heaven? Insane. As long as we’re identifying flowers, what is this in the picture below? From a distance it looked fungus (very pretty fungus) growing up this tree, up close it looks like azaleas, but it’s a tree, so it can’t be azaleas, right? So what is this? Reading Glamour at the doctor’s office, those moments on the subway when I remembered not hating myself so much, meditating with my monthly group. If it were really going to happen, I would have taken the week off so I wouldn’t have wasted my remaining time working at a job I sometimes HATE. 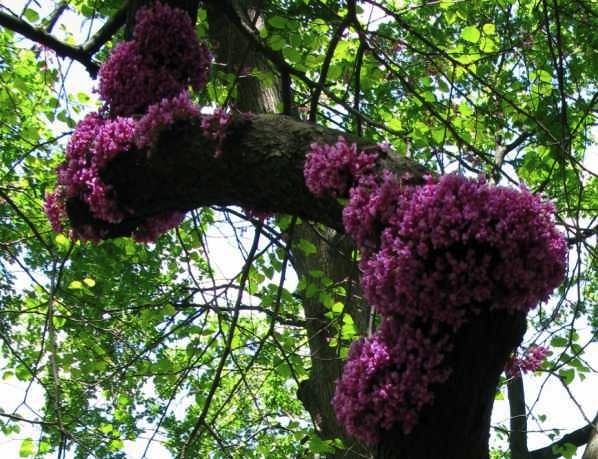 In fact, my header is of redbud flowers. Interesting fact is that they don’t bloom on the end of the tree limbs like other trees, but all over the tree itself. As I’m spiritual but not religious I won’t be going with all those who will be “raptured” on Saturday. Someone has to take care of the cats – mine and yours. I love the new header for your blog!! And ha about someone has to take care of the cats. Because we know THEY’RE EVIL and won’t be going anywhere on Saturday.